Broward County Sheriff Scott Israel rejected calls for his resignation and praised his own performance on Sunday despite numerous failures by his department in the lead up to and during the Parkland shooting which left 17 dead and 16 wounded. Israel told CNN's Jake Tapper that he believes he has "given amazing leadership" as sheriff and calls for his resignation were "shameful" and "politically motivated." When pressed on his description of his leadership as "amazing," Israel blamed his deputies for their failures and claimed they'd received appropriate training. "Jake, I can only take responsibility for what I knew about. I exercised my due diligence. I've given amazing leadership to this agency," he said. "There's a lot of things we've done throughout this—this is—you don't measure a person's leadership by a deputy not going into—these deputies received the training they needed." Israel further defended his performance by saying he couldn't be blamed for mistakes made by deputies. "I've exercised my due diligence, I've led this county proudly as I always have," he said. "We have restricted that deputy as we look in to it. You know, deputies make mistakes, police officers make mistakes, we all make mistakes, but it's not the responsibility of the general or the president if you have a deserter." Florida State Rep. Bill Hager (R.), chairman of the Florida House of Justice Appropriations Committee, sent a letter to Governor Rick Scott (R.) asking for Israel to be removed from his post. His letter details the numerous failures of Israel's department in their interactions with the shooter before he carried out his attack. "An investigation by Sheriff Israel into the unfathomable inaction of these deputies will do nothing to bring back the 17 victims," Rep. Hager said in his letter. "The sheriff was fully aware of the threat this individual presented to his community and chose to ignore it." Hager went on to critique the failure of Israel's deputies to try to stop the shooting despite at least one deputy being outside the building while it was under fire and several others arriving on scene before local police. "Various news outlets have confirmed that the school resource officer and three Broward sheriff deputies were on campus at the time of the attack and chose to take cover themselves rather than stepping up to protect our students," he said. "Not one of these trained officers made an effort to enter the building to protect students and teachers and save lives. It was not until deputies from the Coral Springs Police Department arrived, a department not under the authority of the BSO, that uniformed officers actually entered the school and took action." Israel wrote a response letter to Governor Scott disputing some of Hager's claims and defending his department's performance. "I am very proud of the incredible work that so many from BSO and other agencies (including CSPD, FDLE, Sunrise, FBI, ATF and others) performed on February 14," he said in the letter. "And I am equally appalled that Rep. Hager felt a need to engage in disingenuous political grandstanding, perhaps in the hope he will garner some headlines, at the expense of the truth." 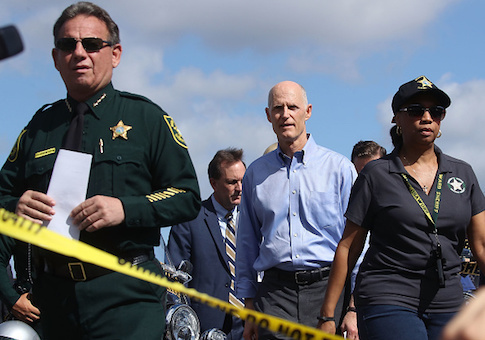 Governor Scott ordered an independent investigation of the Broward County Sheriff's Office handling of the shooter and the shooting by the Florida Department of Law Enforcement on Sunday. The investigation will begin immediately, according to the Sun Sentinel. Israel said his office plans to cooperate with the investigation. "BSO will fully cooperate with FDLE, as we believe in full transparency and accountability," he said in a statement to the paper. "This independent, outside review will ensure public confidence in the findings." It is unclear how long the investigation might take.